While not, sadly, a novel or unique story, it is very plainly written and answers some of the most basic questions concerning how one remains enslaved. It is almost unimaginable for the average Westerner to even comprehend the political and social conditions necessary for such a system to exist- yet at one time they did exist, right here in America. Change the century and the ultimate destination of London for that of the antebellum South and you have a story in common with that of thousands of our own African- American citizens and their ancestors. The simplicity with which Ms Nazer relates her tale only adds to the inhumanity of the injustices inflicted upon her- mentally and physically. She despairs of her lot while never losing complete hope that she will someday be redeemed. 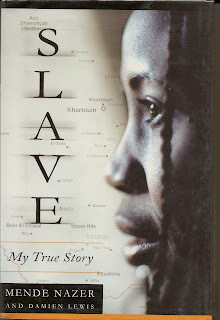 Hers is the tale of all oppressed people down through the ages and even to this present day in Ms Nazers native Sudan. acting in a civilized association with one another, and finding some things just outright unacceptable, that upholds our collective freedoms. And this is the final truth of the book, that we are all connected and our fates are connected,and we are all responsible to one another.